Blue Doom: Halfway to the finish line. - I'm not lost, I just don't know where I'm going. Blue Doom: Halfway to the finish line. · urtidssuppa - Storage vessels. I had procrastinated a long time before the heel. Finally did that yesterday, using the 'double stitch short row heel' AKA 'jo-jo heel'. I just want to cast on sock #2 and start knitting, finishing it in about two days, but my fingertips say NO! No more knitting with Gjestal Raggegarn this week. I want to be able to type without wincing in pain if there's a session this Sunday. 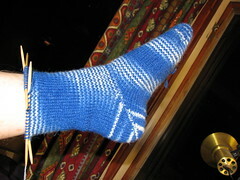 I need to cast on a pair of socks with softer yarn. And I want to dye more. 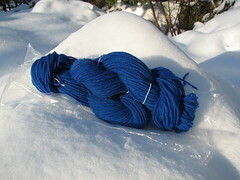 I only have hand-dyed yarn for one more pair of socks ready. Also blue, but solid, and Sandnes Tresko takes up the color better too - in the Raggegarn I dyed solid, there are still small bits of white. Must be slubs of synthetic fiber or something. Now, you are probably asking me, "But Ragnhild, you are obsessed with green. Why are you dying yarn blue, and a second time at that?" Well, back when I was planning Blue Doom, I couldn't find my green dye, but I found the blue. And I named the project "Blue Doom" and liked the idea. I found the green dye before dying the yarn, though. I had decided on blue, and that was that. And then.. how do I dispose of the dye bath, I wondered. I googled around a bit, and the answer I got was that it's okay to just pour it out because it's such a small amount. Uhhh.. no, that's not good enough for me. Hey, I wonder if I can just re-use the dye bath a few times. . . So I re-heated it and dyed those two skeins of undyed Sandnes Tresko I got on Tuesday. And it worked perfectly. In fact I'd say it worked better, but I think that may be because of the higher wool content (80% vs 60%). But I kind of don't have any other beaten up old pots and pans no longer suitable for preparing food in that I can use for dying. Well, I have one, but it's a bit on the small side. I'll check at the used stuff store in Førde the next time I'm there. Next planned dying project will be blue, green, and then a mix of the two. I really should buy some red and yellow... you can only do so much with just blue and green. 7th-Feb-2010 22:44 (UTC) - Storage vessels. At this time of year all petrol stations in Norway have huge bins full of used window cleaning fluid bottles. You just need to nick a couple of those, rinse them, and pour the dye into the bottles. 9th-Feb-2010 07:53 (UTC) - Don't throw the dye bath away yet. Apparently, some yarn dyes (sugar-free Cool-Aid, among others) go clear when they're spent, so you might have used more dye than necessary. As for disposal - I'll need the brand name to check what is the best way to dispose of it. If you try using window cleaning fluid bottles for storage, you need to rinse the bottles thoroughly before use. The stuff inside is a bit environmentally safer than hair shampoo, so it's perfectly safe to throw it away. 9th-Feb-2010 15:22 (UTC) - Re: Don't throw the dye bath away yet. Can we even buy Kool-Aid here in Norway? I'm using Jacquard acid dyes. And I'll keep using the dye bath again and again until it loses potency.